True-Blue Dust-free Series - Don't bite the dust with Inferior Products! BONUS! 11 SANDER DISCS - 2X MORE THAN OTHERS!! Genuine AUCH Brand - True-Blue Dust-free Series - Don't bite the dust with Inferior Products! BONUS! 11 SANDER DISCS - 2X MORE THAN OTHERS! Drywall sanding has always been a laborious and messy job that requires considerable time, effort and money. To make the process easier, Edisons offers an array of highly-efficient UNIMAC Drywall Sanders. Engineered to revolutionize plaster and drywall sanding, these machines come with modular designs, remarkable dust collection, sturdy build quality, outstanding ergonomics and quick return on investment. 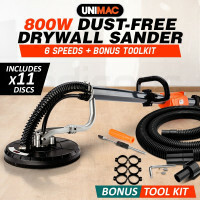 Perfect for do-it-yourself or commercial applications, UNIMAC Drywall Sanders are known for their powerful performance with a lightweight design. 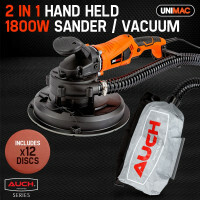 They have enormous power to remove maximum dust through the innovative sander-vacuum combination. Hard-to-reach areas like ceilings are never a problem with the clever telescopic design. 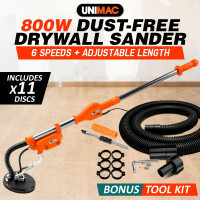 UNIMAC Drywall Sanders carry an ergonomic soft grip handle that comes with everything you need such as a 6-speed control, a throttle and a throttle lock. The multiple grip options are very useful and the detachable lip allows sanding right to a wall’s edge. The machines can also be used with dry and wet vacuums when additional storage is needed. UNIMAC Drywall Sanders are a no-brainer with their flick-of-a-switch operation. Unlike inferior products, dealing with dust is never a problem when using the True-Blue Dust-Free series. Designed to eliminate the need for dangerous ladders, these sanders have adjustable articulating heads that offer great manoeuvrability. Other fascinating features include centered handles for left- or right-handed operation, the bonus sanding discs, large sanding diameter and the strong hook and loop fasteners. You will also love the extensive sander pole length, the brush skirt to prevent scratching and the rust-free aluminium pole body. 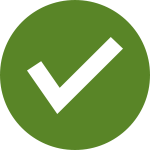 Edisons also offers high-quality Drywall Sanding Disc replacements that can help you achieve professional sanding/finishing results in just minutes. Designed to ensure minimal clean up, the UNIMAC Drywall Sander Replacement Bags are made to withstand even the toughest renovating jobs. For other construction needs, Edisons also sells Commercial Drain Cleaners, Vacuums, Laser Levels, and Jackhammers. 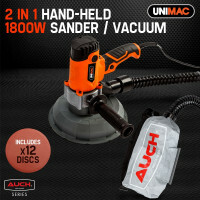 Order a UNIMAC Drywall Sander and bid your old and poorly designed solutions goodbye!